Want to get new students and fill up your studio? Me too! Word of mouth is still the best way, but what do you do when you’re just starting out? I’ve compiled a comprehensive list of advertising strategies online, in print, and in person. No matter which strategies you choose, remember that your target audience is generally women ages 30-45 who have children ages 5-12. (I realize that this is 2016 and other genders and ages could be your target audience–hence why I said generally.) As you are advertising, try and think about what that group wants from you as a teacher. Convenience? Quality Teaching? New Approaches? Don’t try to do it all, just pick 3 benefits and stick with those three in your advertising. Millennial parents usually search online first, so make sure that your online presence is in tip top shape. It’s not enough to have your name on a list, although it is a great first step. Most people need to have some sort of contact with you or your studio 7-12 times before they will commit to lessons. Therefore, you need to have as many places as possible for parents to find you. Before you announce you’re teaching music lessons on your page, take the time to go through your profile and make sure it’s family friendly. No hard partying pictures, profanity, or anything that you wouldn’t want a prospective parent seeing. Once you’ve got that covered, let your social circle know that you’ll be accepting new students into your studio in September. However, don’t spam your circle. An initial announcement the second or third week of August and a follow-up announcement the fourth week of August or first week of September trying to fill up your remaining spots is sufficient. In my experience not a lot of parents follow the Studio Facebook Page, but it is important to have as big of an online presence as possible. This is the place to make announcements about upcoming concerts, quick studio notes, links to your studio blog posts (if you have a website), and inspirational quotes about the power of music and music education. Think of this page as a way to build credibility with prospective parents and keep current parents informed if this is their social platform of choice. In my area, this has been one of the most successful ways to get leads on students. You have to be careful though, as some groups have strict rules about posting that you need to follow. If possible, post once a week from the second week of August to the second week of September. If you are in a smaller community, don’t forget to post on groups for neighbouring communities if there is no teacher there. Another great free place to advertise. As always, use caution and be aware of scams. I find that of the replies you get, about 10-25% will actually follow through with lessons. Unfortunately not all communities will be large enough for this to be an option. However, if you are within an hour’s drive of a community listed, it’s worth a try to post. Smaller communities will sometimes have a place for you to put an online classified. If your studio is doing something newsworthy or you’re planning a concert, see if the website would like to write up a small story about your even. Conveniently mention that you’re starting to teach in that community and are looking for students. In my mind, this is a non-negotiable. It gives you immediate credibility in the eyes of a prospective parent, and is an excellent way to let them get a feel for you and your studio. You can easily set up a simple website with Blue Host and WordPress for less than $50. You will also need to purchase a domain name, which usually costs less than $25. To start with, put up a bio, studio policy, and frequently asked questions section. You can always flush it out with more content later. Then link to your Facebook page and put the blog portion of your website (if you have one) on Bloglovin’ for even more visibility. I like bloglovin’ because there is nothing to maintain once you have your blog on there, but it builds your online credibility. Consider adding Twitter, Instagram, Google+ or Periscope if you keep up with those forms of social media. If you find this daunting, pick two social media platforms and do them well. You can always add more later. City Activities Guides are a great way to get the word out about your studio to a large amount of people. Usually a listing of your activity and phone number is free, then you pay for ad space. The ad space can be expensive, but if you have the budget it is worth it. You can let the city design your ad, or you can use a website like canva.com or picmonkey.com to make something professional looking. Not everything I suggest is going to work for your particular situation. I recommend to try everything you can afford the first year, and cut the stuff that gets you nowhere next year. If you teach in a smaller community, chances are that there will be some sort of “Coffee News” publication. These are generally not read by your target market, but can be a low cost way to get the word out. Neighbourhood Newsletters are an excellent & cheaper way to get your message out to the people who live near you. Ask around no later than June to make sure you make the September issue deadline. If your student numbers are low, you can advertise again in the January issue. Facilities where Mother’s Groups are held. If your local newspaper runs an Arts & Music Activities section in the fall, advertise there. If not, try to schedule your ad for the third and/or last week of August. In my experience, newspaper advertising is expensive and isn’t generally read by your target market. However, your community may be different, so try it the first year and do it again if it’s effective. For around $25, you can order a car magnet through vistaprint.com. Once you choose a design, you can also order matching business cards or other print materials to match. I love the magnetic decal because I can put in on my car in August and September, then take it off and drive in anonymity the rest of the year. If you would like to advertise on your car year-round, a local printing company can put something on your car for $100-$200. Order 100 to start with and keep them on your person at all times. You never know when you’ll be asked about what you do! If you have a stellar head shot, put it on your business card. It is proven that people have a harder time throwing a card away that has a face on it. Don’t be shy! Let your family, friends, and neighbours know that you are looking for new students. Word of mouth has the best conversion rate, so get it working for you! I’ve found in my studio that if someone is recommended to me by a friend, there is a 90% chance that they will become my student. If your community holds a City Wide Registration, make sure you are there! Have a banner, postcards or brochures and your business cards ready to go. Make your table attractive. Display a few small instruments or hand out balloons. Do you know what the most popular activity in your community is? If yes, try and get your table close by. Don’t worry if you don’t have a lot of people stop by the first year. Visibility to your target audience is enough. Word will get around and your will get more people stopping by the next year. Your musical ability is one of your best advertising features. Hold a concert, sing regularly in church, or busk on the streets. Do whatever you can to let it be known that you are one of the best musicians in your community. Sometimes Mom’s groups allow businesses that relate to kids and parenting to make presentations. Could you volunteer to give a free group music class to the kids and their parents? Could you lead the singing of a few nursery rhymes and chants? If you are a Mom with a small child, show up and participate in the group. The question as to what you do will always come up. Even if none of those moms put their children in lessons with you, word will get around to your target market that you are available to teach lessons. 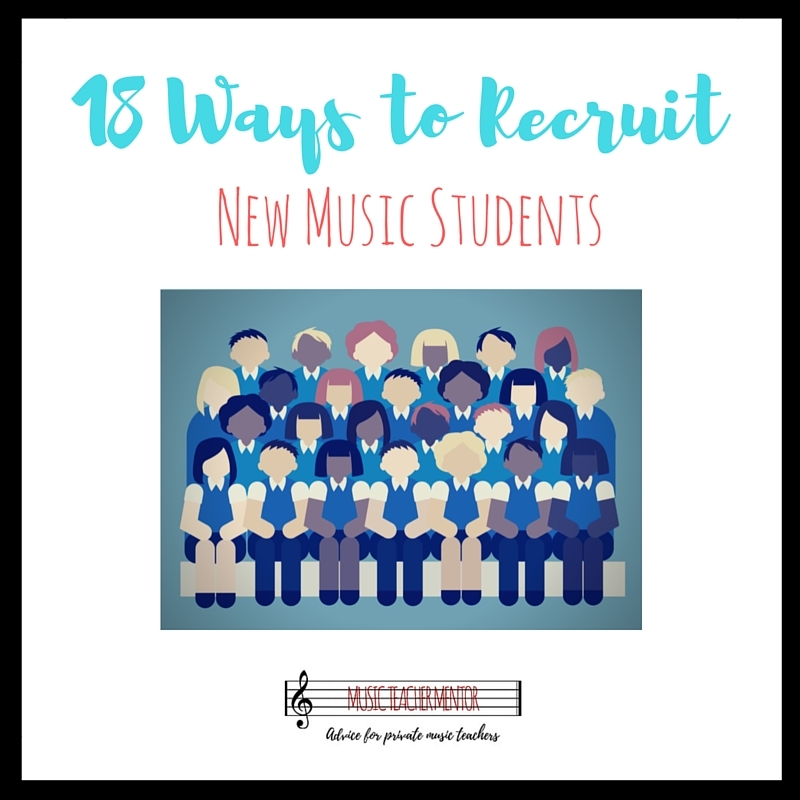 If there is a local Music Teacher Group in your area, join it! Make connections with the other teachers and take advantage of any programs they have to offer. Often you get the benefit of group advertising, and they list your studio online as well. You also give yourself credibility as a teacher, as you usually have to have a certain level of education to be a member. Attending the meetings of my local group turned out to be vital to getting students the first year I opened for business. More about that in another post! Did I miss anything? I would love to hear what worked for you your first year of teaching, or if you’ve had increased success on different platforms.